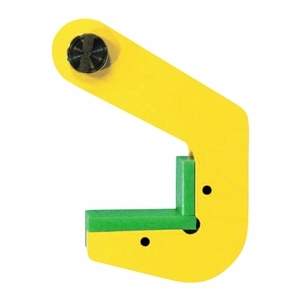 TPH clamps are used for the horizontal lifting and transporting of steel and concrete pipes without damaging the product. The jaw is covered with a special high quality pressure resistant plastic. They feature a compact design and high lifting capacity. TPH clamps are also maintenance-friendly--the plastic pressure resistant cover is easy to change. These clamps should always be used in pairs (a minimum of two clamps per lift), and the Working Load Limits shown below are based on one pair of clamps, not per piece. Available in a range of sizes, with jaw openings from up to 2.76" and capacities up to 20 tons.